Keeping track of email can be a full-time job, even when you're only using it for basic correspondence. But, more often than not, we're also using email to keep track of tasks, issues with ongoing projects, and so much more. And that's when problems can occur, with messages getting lost or overlooked as we toil under the weight of more and more email. That's where IssueBurner can help: it's an issue tracking and help desk service for small businesses, and it's one that works right inside your own email application. IssueBurner's Web interface makes it easy to see who's working on the tasks you've created. IssueBurner is available in three versions: Lite (Free; up to 2 members), Silver ($9 per member per month; up to 50 members), and Gold ($19 per member per month; unlimited members). To use the service, you simply need to sign up: No downloads or software installations are required. To use IssueBurner as an issue tracking service, you create a group to which you can add co-workers. You then get an issueburner.com email address for that group (such as pcworld.reviewers@issueburner.com), which everyone can then use for correspondence about the issue in question. IssueBurner then creates issues for each message that's sent, and all of the group members are notified. 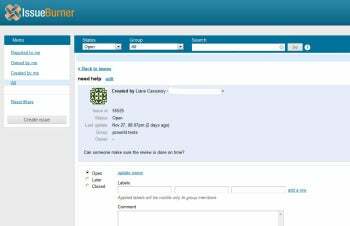 Issues can be tracked and acted upon from IssueBurner's site, where group members also can make comments and mark tasks as completed. The interface is simple and straightforward, and the entire process is simple to understand. The hardest part about using IssueBurner might just be getting folks to remember to use the group email address instead of your individual one. To use the service as a help desk application, you can forward your existing support email address to an IssueBurner-created address. Then, whenever messages are sent to that address, tasks are again created in IssueBurner's Web interface. These tasks can be arranged in order of priority and can be assigned out for completion. Vendor Webyog (who also make useful Google/Twitter search tool CloudMagic) says that IssueBurner is designed for companies with two to 500 employees, but its features might be a bit basic for companies at the upper end of that estimate. It competes with products such as hosted help desk services from ZenDesk and Assistly, as well as task management services like TaskForceApp.com. IssueBurner attempts to integrate the key benefits of these services into a single, integrated app. Rival IssueTrak also offers issue tracking and help desk services, but is a more expensive application that comes in both cloud-based and installed versions. IssueBurner offers a simple way to keep issues, tasks, and help desk requests straight. The beauty of this approach is that it does so without requiring you to do anything other than use your own email client. Note: The Download button takes you to the vendor's site, where you can sign up to use this Web-based software. IssueBurner offers an easy way to track tasks and issues, without requiring you to step outside of your own email app.